Liverpool boss Jurgen Klopp said “fighting” rather than performances is key at this stage of the season, after they went top of the Premier League with a late victory at Southampton. The Reds came from a goal down to win 3-1, their second goal a brilliant Mohamed Salah strike. “We had a few performances not on top level but we were always in the game,” said Klopp. Manchester City, who face Brighton in the FA Cup semi-final on Saturday, now trail the Reds by two points but have a game in hand with six matches left to play. The title lead has changed hands 25 times this season – the joint second most in a campaign since 1945. Liverpool’s 82 points is their highest tally after 33 games. “People want us to play like City,” said Klopp. “We are not able to do that, why should we do it? We have our way to play football, it’s a nice way and a really good way. Shane Long gave Southampton an early lead before Naby Keita headed the equaliser for his first Liverpool goal. The Reds have scored 20 goals in the final 15 minutes of games this season, more than any other side, and have also won a league-leading 16 points from losing positions. And yet again their fighting spirit came to the fore. Salah ran from his own half to give them an 80th-minute lead – his first goal in nine games and his 50th Premier League goal for the club. Jordan Henderson added a late third. 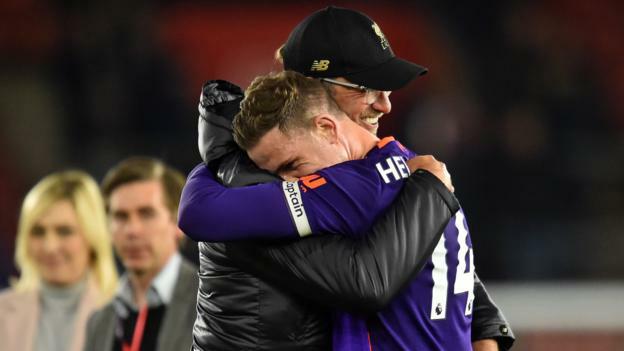 Henderson, a second-half substitute, believes his side will need to win every game to seal the club’s first title since 1989-90.